"It is pleasant though, rooms are generally cleaned and servi..."
Have a question for Suriwathi Hotel? "Great friendly hotel, authentic hotel for all age groups." With excellent location ratings, the Suriwathi Hotel allows you to easily enjoy all that Bali and its surroundings have to offer. The rooms at this hotel offer pool and garden views for guests to choose from, so you are bound to be peeking out at lovely scenery. This hotel is close to Ketut Art Shop 14, Pasar Seni UbadArt Market, Windy Sun Surf School, Legian Beach, and Alta Moda Fabric Store and Tailor. It has various convenient features, such as a currency exchange, a library, a smoking area, as well as safety deposit boxes. The Suriwathi Hotel features family rooms, so your whole family will have ample space to lounge around together. It is equipped with a kids swimming pool to keep your children happy and entertained all day long. It has a bar, a coffee shop, restaurants on the property, BBQ facilities, and a poolside bar for guests to enjoy during their stay. This hotel has a garden, a spa, and an outdoor swimming pool, among other amazing facilities. Offering guided tours, it is a great spot to stay to learn about your surroundings and see everything you can while you're here. Massages are available, meaning that you can stay in the area and spend the day relaxing and indulging yourself at the massage place nearby. The Suriwathi Hotel provides free Wi-Fi in all rooms, as well as Wi-Fi in common areas, allowing you to access the web without splashing out on roaming and data costs. 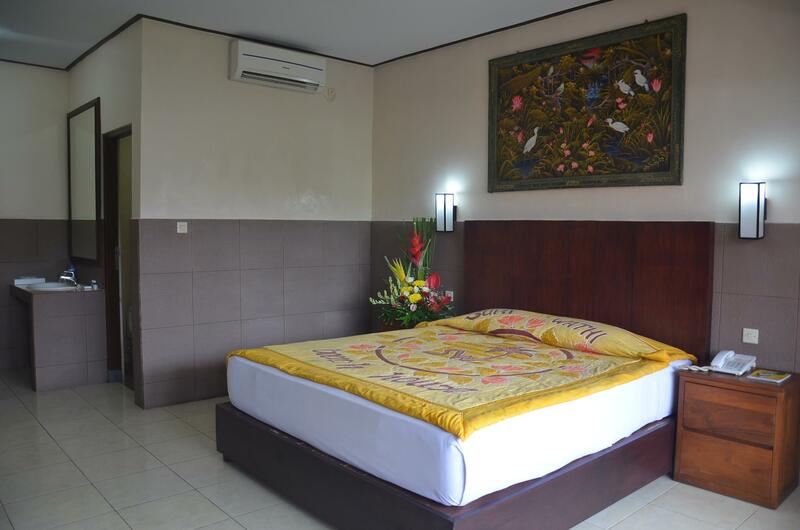 With daily housekeeping, luggage storage, and laundry services, the hotel has a range of convenient services to ensure that you get the most out of your time in Bali. With pet-friendly facilities, it is suitable for pet owners who can't bear a weekend away without their entire family. The front desk is open at all hours, so there will always be a member of staff behind the desk to assist you with any queries. Check-in is offered from 01:00 PM and check-out is until 12:00 PM. The Suriwathi Hotel offers a range of transportation options, such as airport transfers, car rentals, and shuttle services. Tegal Sari Bus Terminal is 6.6 km away and Bemo Gunung Agung Bus Terminal is 7.2 km away. The nearest airports are Ngurah Rai International Airport (DPS) and Lombok International Airport (LOP), which are located 4.8 km and 120.3 km away. This hotel provides an express check in and check out service, enabling guests to avoid having to visit the front desk to settle their bill. "Located in nd area I like with plenty of good places to eat." I cannot complain staying here. Everything good. Good breakfast as large as you make it.Joe was so friendly helpful and polite in the restaurant area. 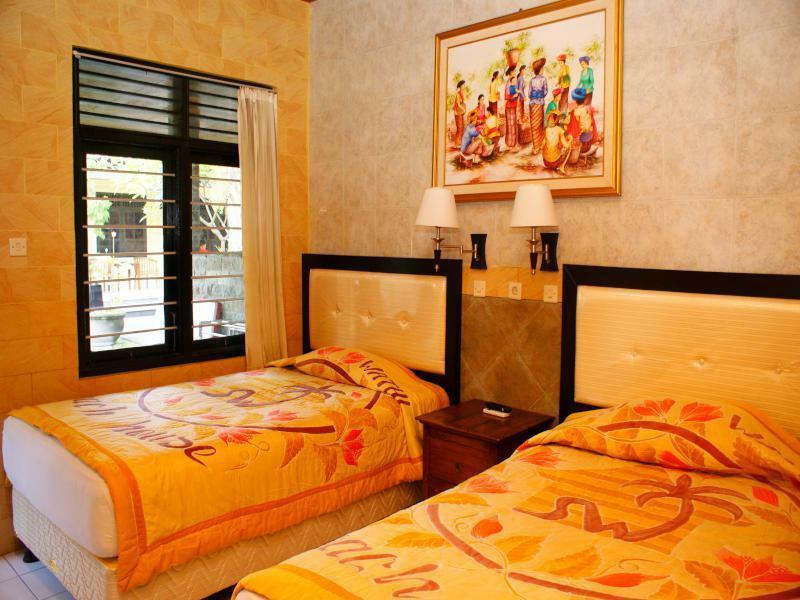 Nice and quiet for sleeping but you are in the heart of Legian tourist area. Only 10 minutes walk to good surfing beach. All the staff were so friendly and helpful, I would come again. Good service, location and room, also the pool is a plus. All the staffs are nice. Location is in the center, walking distance to the stores around. I/we, would recommend suriwathi even for budget traveller. I booked a double bed room and was given a twin room and had to pay $10 a night extra for a double bed room even though my booking clearly stated a double bed room. The room was tiny and dirty with mould on the pillows and stained sheets, the pool pump had broken down so no pool. Our group shared the night with several cockroaches and we asked for, and was given, our money back in the morning. Location is superb, just off garlic lane which has excellent restaurants and cafes. Rooms are dated but ok for the price. Standard rooms have no kettle or fridge or outdoor chairs. The two pools are very nice. Breakfast average. Great place to stay. Will definitely stay again. Location is great and staff were extremely polite and obliging. Breakfast was basic but tasted good. There are 2 pools which were clean and refreshing when you are hot. It has nice gardens and the patrons are welcoming and friendly. Great family atmosphere. Discussing. There were dirty bed covers with blood droplets all over them as if they were 19 years old and never been washed. The room stunk badly as if something had died in it. Just nasty. Only stayed for 3 hours. clean room and very good airconditioning. we loved the bed. staffs are accomodating and approachable. felt safe during our stay. limited choice for breakfast but still great value for money. Great little hotel! Had a few small problems, but staff always on hand to fix. Very quiet inside the hotel compound even though in a busy location. Gardens nice, hot water works well because they have installed solar. AC works well although every time we returned to room staff set to coldest, guess they enjoyed it! Towels and bed good and comfortable, but would suggest extra pillows as standard. Stayed in superior room which was good, but may pay the extra for deluxe next time. All up very few complaints and are probably going to stay there again even though we normally like to try different hotels each trip. Well done and happy to recommend to anyone looking in that price range. My stay was great. The staff was very helpful and really made sure that anything that I needed was taken care of. The hotel was quiet and isolated, giving it a very cultural feeling. It was about 3km from the main center of Ubud and the hotel will drop you off there for free or even better you can rent a scooter for I think 70K. I would stay here again. Located in nd area I like with plenty of good places to eat. Breakfast is very basic but the setting in beautiful gardens, friendly staff and not impersonal multi-storey makes this a charming place to stay. The staff is amazing! Joe and the crew were nice to us. They even tried to speak some Filipino words to relate with us and make us feel at home. They were warm. The only concern I have was the free airport transfer because we arrived an hour before midnight. But overall, the rooms were clean, the wifi was strong, the staff...was amazing. The place was also easy to locate. Most of the drivers know where the place was without encoding it in Google maps/Waze. Good value for money! I have stayed here before and find the pool, location and price the major draw card for me if I am staying in Legian only a couple of nights. I felt like I had entered the ' Marigold Hotel' with many older Australians here on this occasion. This was which good because I did not have to put up with loud parties in the complex. The breakfast is just ok but I will stay here again as it is cheap and clean enough.